Scores of officers and enlisted sailors crowded onto the busy deck of the USS Shreveport warship September 20 to honor a fallen comrade and officially open a facility named for him. Housing nine computer terminals, educational materials and a small library collection, the Media Resource Center - which provides about 700sailors and Marines access to computer-aided learning opportunities, as well as e-mail and Internet service - was named for Petty Officer 2nd Class Kris Romeo Bishundat, who served on the Shreveport before being transferred to the Pentagon four months before the terrorist attacks. 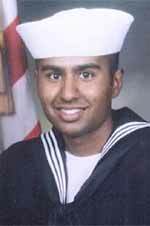 Bishundat, who would have turned 24 on September 14, was assigned in May to the communications division of the Chief of Naval Operations Center at the Pentagon. An information systems technician there, Bishundat had moved to newly renovated offices three weeks before the attacks. He had enlisted in the Navy six years to the day the terrorists struck. A native of Guyana, Bishundat was a sensitive, humble son, said his mother, Basmattie Bishundat. It wasn't until her son's death, she said, that she learned about his meteoric accomplishments. He never talked about half the awards he won, she said. 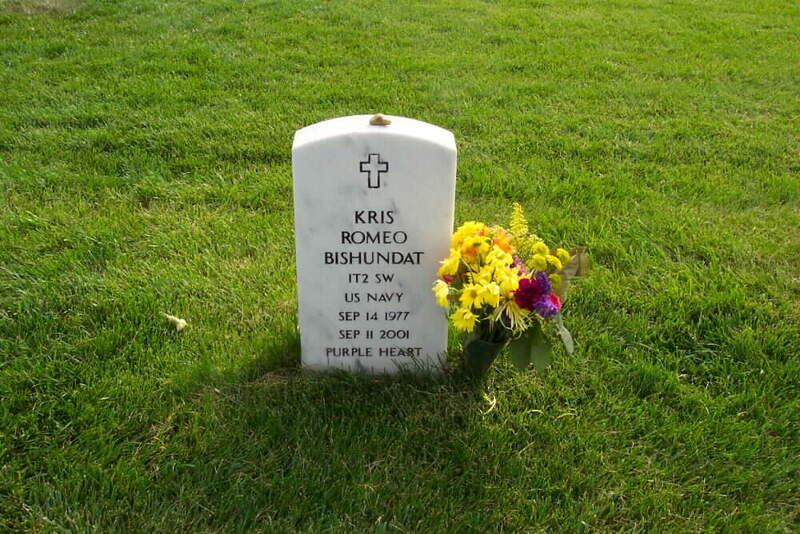 In just six years, Bishundat had received the Navy and Marine Corp Achievement Medal, Navy Unit Commendation, the National Defense Service Medal, the Sea Service Deployment Ribbon, the Armed Forces Expeditionary Medal and the Good Conduct Medal. 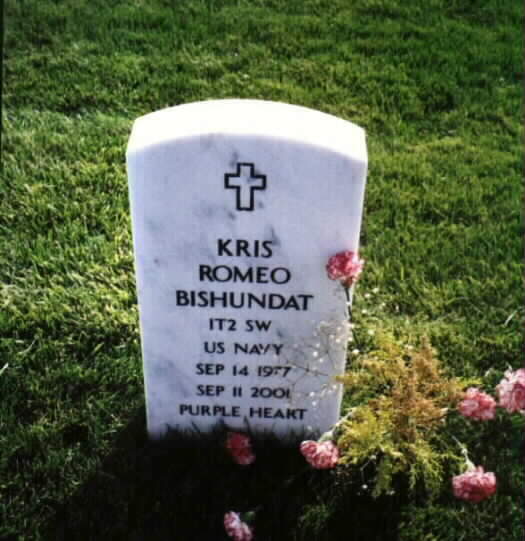 He was awarded the Purple Heart posthumously October 18 at his funeral in Arlington National Cemetery. mother and his father, Bhola. He was the oldest of three children, including sisters, Danita, 21, and Devita, 18. He enlisted in the Navy two days before he turned 18 and was assigned to the USS Yorktown for a year until October 1997. Reassigned to the Shreveport as manager of the ship's automated information systems department, Bishundat was responsible for a multitude of complex computer and data processing equipment, operating as the ship's webmaster. A former supervisor, Emanuel Chestnut Jr., was quoted as saying he had "never in 20 years in the Navy worked with anyone as unselfish as Bishundat." sensitive side also, she said. His mother recalled how, in a conversation with him about an hour before the attack, he expressed how he was so touched that his sister, Danita, not only took the time to pack his lunch but also wrote a note telling him to enjoy it. He was so touched by it, he also told his girlfriend, Lisa Kenney, about the note in a phone call to her before the attack. "He was very sensitive," his mother said. "I couldn't have asked for a better son." Of Waldorf, Maryland died September 11, 2001 of a terrorist attack while stationed at the Pentagon. He leaves behind his parents, Bhola and Basmattie Bishundat; sisters, Danita and Devita Bishundat; grandfather, Santall Persaud, a very special friend, Lisa Kenney, and a host of family, friends, and co workers. Viewing will be Wednesday, October 17, 2001 4 to 9 p.m. at the Jaycee Hall, 3090 Crain Highway, Waldorf, Maryland. A second visitation will be on Thursday, October 18, at HUNTT FUNERAL HOME, Inc., 3035 Old Washington Rd., Waldorf, Maryland 20604 from 9:30 a.m. until 11:30 a.m. where a procession will depart at 11:50 a.m. for interment at Arlington National Cemetery. In lieu of flowers you may contribute to: The Bishundat Memorial Fund, P.O. Box 1733, Waldorf, MD 20604. NOTE: ST Bushundat was laid to rest in Section 64 of Arlington National Cemetery, in the shadows of the Pentagon.